It’s getting easier than ever to catch up on videos without an Internet connection. Premium movie channel Epix says it will support offline viewing this month, letting phone and tablet users download movies such as Interstellar and The Wolf of Wall Street. This is a first among “TV Everywhere” apps, which are offered by individual channels to cable and satellite TV subscribers. Other TV Everywhere apps, such as HBO Go, Comedy Central, Showtime Anytime, and FXNow, still require an Internet connection to stream their videos. 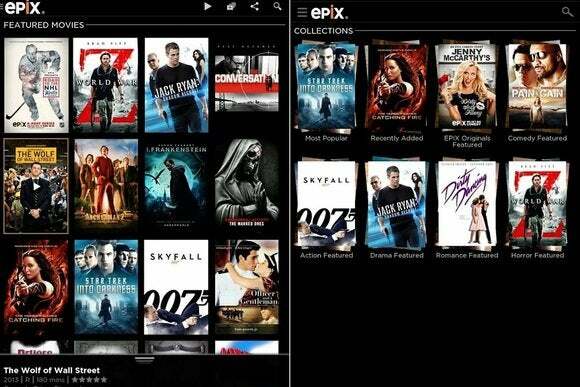 Epix will support offline viewing on iPhones, iPads, Android phones and tablets, and Amazon Fire tablets. Some pay TV providers, such as Comcast Xfinity and Dish Network, already support offline viewing for DVR programs, as do certain TiVo models and accessories. But this requires a bit more foresight—first you must record the show, then you must download it to your mobile device—and many premium networks block this capability. Until recently, the only other legal way to download movies and shows was to rent or purchase them through a la carte stores such as iTunes, Amazon Video, and Google Play Movies & TV. But slowly, things are starting to change. Amazon Prime added offline viewing support for phones and tablets a couple weeks ago. Netflix is still making excuses for why it can’t do the same, but is no longer completely ruling out the possibility. Unfortunately for cord cutters, it’s currently impossible to access Epix’s apps without a traditional pay TV subscription. (The channel is available through Sling TV, but the TV Everywhere app is not.) But with HBO and Showtime both offering standalone streaming services, it’s always possible that Epix could follow suit. Why this matters: Epix sees itself as something of a leader in the TV Everywhere space, being the first premium network to put its shows online and to support certain platforms such as Roku, Android, and Xbox. Even if you don’t subscribe to Epix, you can hope this is a sign that offline viewing is about to become much more widespread among TV Everywhere apps.